In 2011 Peter Madsen left his estate to York Museum’s Trust. Amongst is bequest was his art collection. 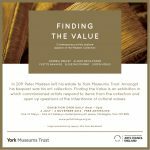 Finding the Value is an exhibition in which commissioned artists respond to items from the collection and open up questions of the inheritance of cultural values. Artist Simon Venus has created a mechanical tableaux for the exhibition. Simon Venus describes Passed On as a eulogy, or tribute, to Peter and Karen Madsen. Items from their collection are arranged in three animated tableaux, which play with the dramas of life, death, identity, depiction and portraiture in miniature theatre dioramas. Passed On explores mortality and transition in both the spiritual and secular worlds. A triptych, referencing religious altarpieces that often included ‘donor’ portraits to commemorate individuals and their families, there are also elements of ‘ Cabinets of Curiosities’ with their usually tightly packed, eclectic mix of interestingly labelled objects. 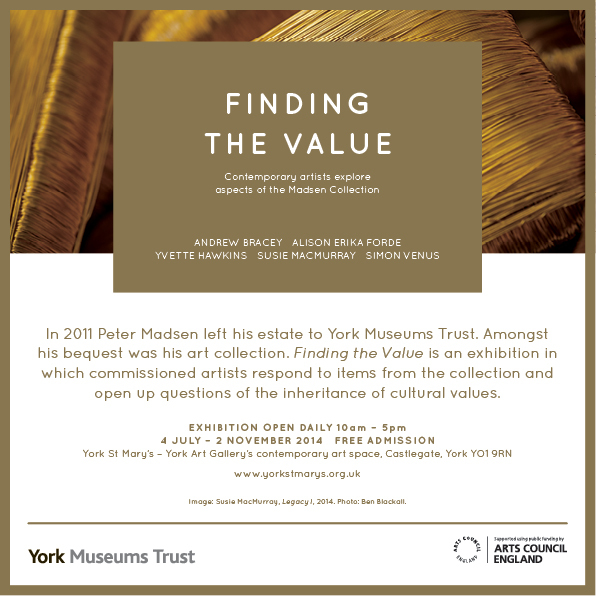 The artist was intrigued by the fact that the collection was given quietly, with no meeting between the donors and York Museums Trust, accompanied simply by a solicitor’s letter and a second, personal letter from Peter Madsen. The importance of these letters in the transfer of the collection from private to public ownership features in the central tableau.